What have Channel 4’s biggest comedy launch in five years, Sky Atlantic’s highest ever viewership and BBC One’s biggest Tuesday night drama launch of 2018 all got in common? They are all projects that filmed in Northern Ireland with funding from Northern Ireland Screen; Derry Girls, Game of Thrones season 7 finale and Mrs Wilson. As we approach the end of 2018 we are delighted to report on another great year for the screen industries. Throughout 2018 production of TV drama continued to boost the local economy and provide employment for hundreds of people. Cameras rolled on Krypton series 2, Dublin Murders, Mrs Wilson, Doing Money, Death and Nightingales, Derry Girls series 2 and Line of Duty series 5. Torvill and Dean also shot on location here earlier in the year and will be aired in a primetime slot on ITV at 9.15pm on Christmas Day. Derry Girls series 1 aired in January and has been on the awards path since, picking up two IFTAs for Best Comedy and Best Writer (Lisa McGee), the Radio Times Comedy Champion 2018 Award, the Best Comedy Series Award at Edinburgh TV festival and the RTS Craft Award for Best Director of a Comedy (Michael Lennox). Derry Girls is also nominated for Best Comedy Series at the 2019 Broadcast Awards. Line of Duty series 4 was nominated for four BAFTA Television Awards; Best Supporting Actor (Adrian Dunbar), Best Leading Actress (Thandie Newton), Best Drama Series and Virgin TV’s Must-See Moment. Our animation sector continues to go from strength to strength, with Sixteen South’s Lily’s Driftwood Bay being nominated for Best Pre-School Series at the 2018 International Emmy Awards and taking home the IFTA for Best Animation. Pablo from Paper Owl was nominated for a Children’s BAFTA. 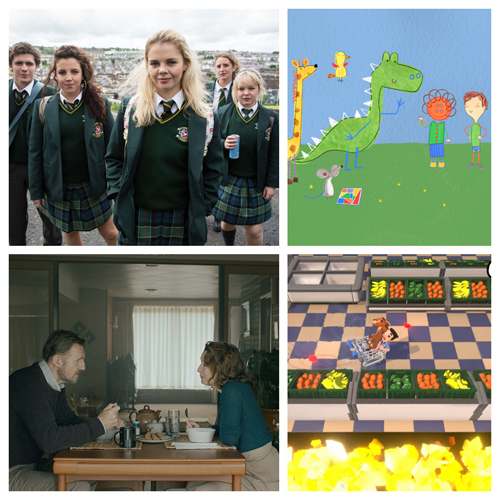 Three of the six projects shortlisted for Best Pre-School Programme at the 2019 Broadcast Awards are from Northern Ireland; Sixteen South’s Claude, Jam Media’s Becca’s Bunch and Paper Owl’s Pablo. Northern Ireland Screen has upped its ‘game’ in terms of support for our growing cluster of local companies involved in games development. The Pixel Mill, a creative co-working space designed to hot house local game development teams was officially opened in November. Seven start-ups are in place and over the coming months it is hoped that more developers will take up residence in what is undoubtedly one of best supported games incubators in the UK and Ireland. One of the current Pixel Mill residents, Vicky Potts of Whitepot Studios, scooped the Rising Star of the Year – Development Award at the MCV Women in Games Awards earlier this year. BillyGoat Entertainment’s Supermarket Shriek won Best UK Game at Gamescom in August and has recently been released on Xbox Game Pass. The factual entertainment sector has continued to grow in 2018. My Family Secrets Revealed, a new 15-part hour long series produced by Newry based Big Mountain Productions began airing on Channel 4 at the beginning of December. Using a team of genealogical and historical experts, this series helps the public connect directly with their family history. Belfast based Stellify Media recently wrapped filming on Flinch, an all action comedy game show with one simple rule: do not flinch. This 10-part original entertainment show for Netflix is due to air in 2019. In June a new partnership agreement between the Public Record Office of Northern Ireland (PRONI), Northern Ireland Screen’s Digital Film Archive and ITV was signed to safeguard the extensive catalogue of UTV archive material, dating back over the past 59 years. The partnership, funded by the Department for Communities, will preserve UTV’s culturally rich archive through an ongoing digitisation process. Our Digital Film Archive joined forces with PRONI again in October to present Belfast’s first Home Movie Day. Part of an international festival, the event celebrated amateur films and filmmakers, providing the opportunity to have old footage assessed and examined, alongside screenings of archive material. In February Northern Ireland Screen’s Irish Language Broadcast Fund (ILBF) brought TG4’s Gradam Ceoil to Belfast. Known as the Oscars of traditional music, this was the first time in its 21-year history that the live concert and awards ceremony took place in Ulster. Featuring the crème de la crème of Irish music and song. Gradam Ceoil will return to Belfast again in 2019. In June the ILBF joined forces with broadcasters from Scotland, Wales, Ireland and Northern Ireland to establish the Celtic International Fund. The Fund aims to develop programmes in the Celtic languages to reach audiences worldwide. Content funded by the ILBF continues to be received well by audiences at home and farther afield with Rocky Ros Muc screening in New York and picking up awards at the Celtic Media Festival and RTS NI Awards. Lomax in Éirinn had its world premiere at a packed-out screening at Galway Film Fleadh. With support from the Department for Communities we launched a Foundation Academy for Animation which is being delivered by Nerve Belfast. Aimed at 16-19 year olds, and supported by the industry, it has been set up to help develop the best young talent interested in animation. The Academy is based on the format used in our partnership with the BFI Film Academy which has been running successfully for 5 years now. The jewel in the crown of our industry education is that we have a formal GCSE and A-level qualification in Moving Image Arts (MIA), more than 1200 students study this subject each year. The recent CCEA MIA showcase displayed the vast array of talent taking the subject with something for all tastes on display – a grisly zombie horror story, a witty sci-fi comedy and a stylish crime thriller. In the New Year we hope to launch a ScreenWorks programme in partnership with Into Film for young people (aged 16-19), who want to pursue a career in the industry.